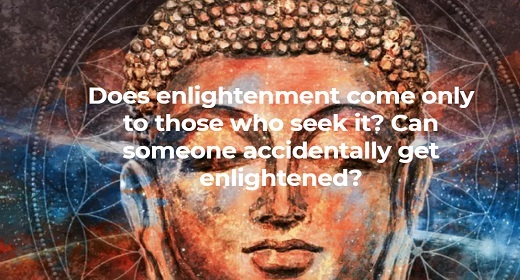 Does Enlightenment Come Only To Those Who Seek It? Gurudev Sri Sri Ravi Shankar: Yes. Someone can accidentally get enlightened. I know of a soldier, in 1971 Indo-Pak war, he was shot. He is from Haryana. He was on his horse and he got shot in the neck. He survived that but he then he got enlightened. The man suddenly saw himself not being the body and it was an accidental enlightenment. He passed away in the late 80’s, he was a very nice gentleman. When there is total harmony and synchrony between the left and right hemisphere of the brain, and when the parasympathetic and sympathetic nervous system are working in harmony, then you say that this is an altered state of consciousness. And this altered state of consciousness which can be physically measured today, is what is called enlightenment. But then after enlightenment, he wanted to know more, study a little more, after enlightenment he went to look for a Guru (Mater). He needed a Guru. In those days a lot of this caste politics was there. Almost like Eklavya, he sat outside kutir of his Guru, and just heard and learned what the Guru was talking to other students. Then he thanked his Guru and then he came. He was living in Kotla, Mubarakpur. There was a drain in New Delhi, Kotla area, he used to live there. He was married, he had children. But then he made his own little kutir, an ashram, he used to sit there. He had just passed second class in the school, not very educated, but a very wise person. There are many such examples, many many people. That is possible. But you know, here again, they must have done something in the past life. In this life, it appears to be an accidental one, but really not, it is all in the grand plan. I used to meet him, I was only 23 or 24 at that time. And he used to call me as ‘Oh, Yogiraj.’ I was a little shy to listen to all those praises. ‘You have come after so many thousands of years.’ He used to tell me, ‘The whole world is looking for you.’ This is how he used to talk to me. But he was very rude to other people. He used to have a stick and used to chase people out, rude means in a sweet manner. He used all the slangs. But he had the vision, he knew, he could see. There is no criteria for enlightenment. You have it already. When will it come out, when will it blossom, is completely a mystery.